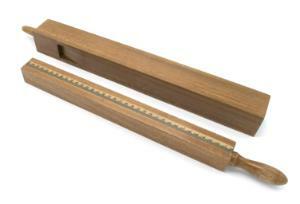 Polished wood organ pipe for investigating beat phenomenon. Labs polished wooden organ pipe with movable piston is marked with the chromatic scale from C(512) to (1024). It has a fully extended length of 34.5" and works well for investigating the phenomenon of beats in conjunction with a second pipe of the same type.